Party Balloons For All Occasions can also design your individual helium balloon floor displays. 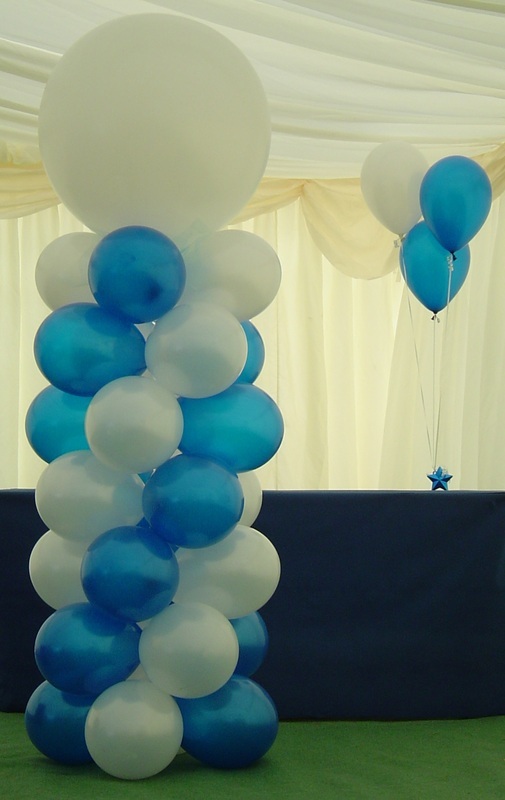 The helium balloon displays can compliment the table displays in colour and style. Or you may wish to personalise your helium balloon floor displays by using some of your ideas and designs to compliment the overall theme of your celebration. Latex and foil helium balloons can be used in the design and the height of the helium balloon floor display can vary according to your venue. See some of the photographs following to give you an idea of what can be achieved. Foil Super shape with air-filled balloon clusters at base. Mixed Floor-Standing Bouquet using latex and foil balloons. Large Air-Filled Column with 3' latex balloon at top. Another mixed bouquet using latex and foil balloons. 'Spiral' floor bouquet with 16" latex balloon at top. 'Funky' style floor display using foil balloons and modelling balloons. Large Floor-Standing Column with foil balloon at top. Air-filled Christmas trees can be displayed for the complete Christmas season.